Depart USA to Adana, Turkey via Istanbul. Upon arrival in Adana you will be met and transferred to your hotel, balance of the day at leisure. Dinner and overnight at your hotel. Drive this morning to Seleucia the seaport that was responsible for the tremendous wealth and expansion of Syrian Antioch, named after Seleucus Nicator I around 300 B.C. The port was founded first, then a trade route established, and finally the planting of a major city. Located a few miles from the mouth of the Orontes River, the flow of goods made their way the fifteen miles to Antioch. There may have been about 30,000 inhabitants during the time of Paul’s travels. Seleucia was the seaport from which Paul and Barnabas left with John Mark for their first missionary journey to Cyprus 49 A.D. Acts 13:4. Part of the ancient harbor can still be seen, although it has since silted up. 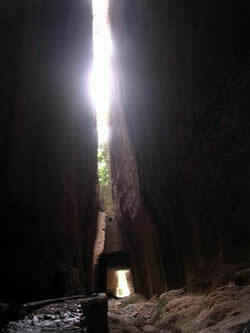 Visit Titus’ tunnel, as it is called today, cuts through the solid rock of the mountain in two places. The tunnel is dated based on two inscriptions. The inscription shown here was dedicated to Vespasian and Titus, so construction of the tunnel probably began in 70 A.D. However it was not finished until the second century. Continue to Antioch, visit the Grotto of St. Peter considered to be one of the earliest Christian houses of worship. The word "Christian" was first used in Antioch. Paul was missioned by the church of Antioch for the first journey here. Later visit the spectacular Antakya Archeological Museum , see the most remarkable Roman floor mosaics. Return to your hotel for dinner and overnight. Drive this morning to Tarsus the hometown of the apostle Paul, a city of great importance as a learning center of the ancient world, alongside Alexandria and Athens. Visit the excavations that have turned up a paved city street along with a colonnaded podium, which may date to the 2nd century B.C. Visit the remains that have been found from the Bronze Age, baths, a Hellenistic portico, a Roman theater, and many terracotta figurines of deities, animals, people, and various mythological creatures. Continue to Derbe a city in the district of Lycaonia in the Roman province of Galatia in south central Asia Minor. It sat on a major route connecting Iconium to Laranda and was about 60 miles from Lystra. 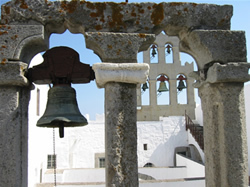 Paul and Barnabas fled to Derbe and Lystra on his first missionary journey when city officials of Iconium plotted to stone them (Acts 14:6-21). Paul does not mention suffering any persecution in Derbe (2 Tim 3:11). Lystra (probably the hometown of Timothy) served as a market town of Lycaonia in south central modern-day Turkey. Paul preached here on his first missionary journey (Acts 14:6-22). After he healed a lame man, the superstitious citizens immediately assumed that he was Hermes (messenger of Zeus) and Barnabas was Zeus himself (same as the Roman god Jupiter). 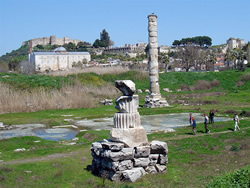 There was a temple to Zeus near the gates of the city, and a statue of Hermes dedicated to Zeus was found here as well. Continue to your hotel in Konya for dinner and overnight. This morning visit Antioch of Pisidi, the city was founded in the 3rd century by either Antiochus I or II, but it only achieved prominence after its re founding as a Roman colony by Augustus in 25 B.C. Visit this triumphal arch gateway, the gate was built in the second century A.D. and was dedicated by Hadrian in 129 A.D. on his tour of Asia Minor. The city was a major Hellenistic center in the centuries before Paul's arrival. 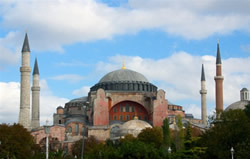 It was located along the route from Ephesus to Cilicia. The Romans for political and commercial reasons brought Jewish inhabitants to the city and it was to this community that Paul preached on his first missionary journey. 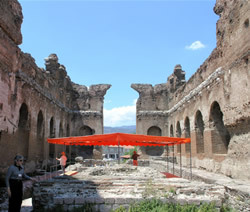 Visit the temple of Augustus who was regarded as the city's founder, this temple dedicated to him was built after 2 B.C. and became the focal point of the city. Continue for the ancient city of Perge. The region was called Pamphilia in the ancient times. Perge was founded by Greek settlers following the Trojan Wars and Alexander the Great had used Perge briefly as a base of operations. Visit this majestic ancient city, the Roman city gate complex walk thru the arcaded boulevard; see the Agora and the mosaic floors, the still standing Stadium, the Grand Theatre. St. Paul visited this city on his first missionary journey, he came with his companions from Baphos-Cyprus by boat , here John Mark left them to Paul's disappointment . Paul and Barnabas continued to Taurus Mountains and reached to Psidian Antioch at north. Continue by coach to Aspendos, which boasts a complete aqueduct system,parts of which are still standing , the water used to reach to the city from mountains Visit the most well-preserved ancient Roman theater in the world is here. As many as 20,000 people can be seated here and the acoustics is so good that a whisper or even a pin drop can be heard from the very top gallery. The theater is still used today for concerts and theatrical presentations. 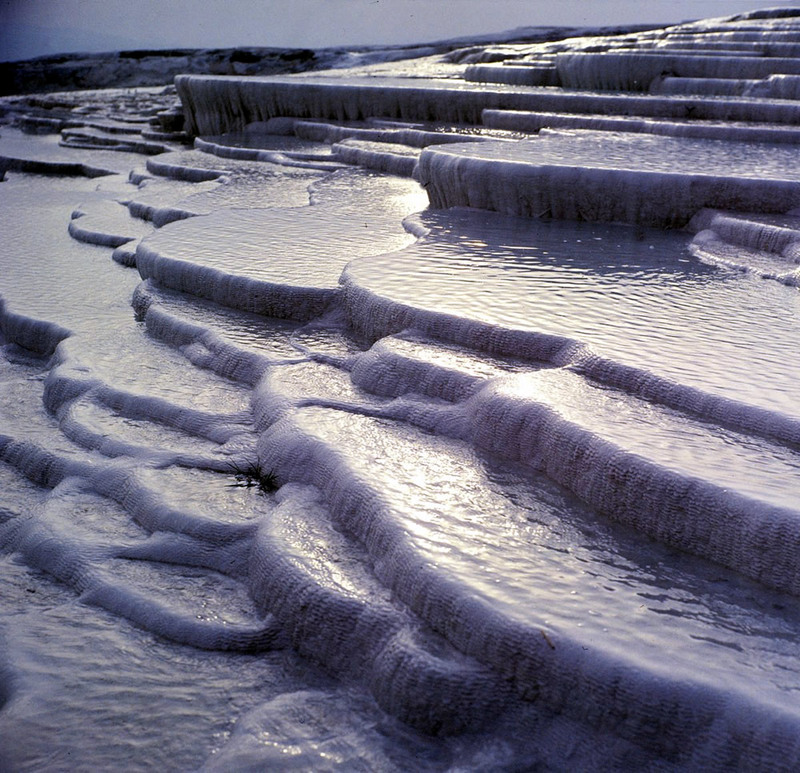 Following your visit continue over Taurus mountains to Pamukkale for Dinner and overnight. 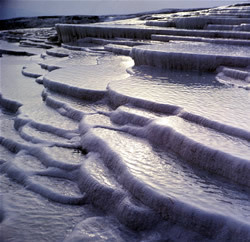 HIERAPOLIS, THE SACRED CITY: In the first century it was part of the tri-city area of Laodicea, Colossae, and Hierapolis. 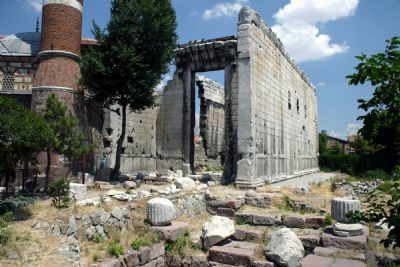 Visit the Byzantine street and Gate, The Apollo Temple with its foundations that date to the Hellenistic period, but the structure itself was built in the 3rd century A.D. Apollo was thought to be the city’s divine founder. The temple was built beside the plutonium, an underground cavern from which poisonous gases emerged. Visit The city’s theater which stands in the background. Visit the Necropolis that contains sarcophagi, many different types of tombs, and funeral monuments dating from the Hellenistic until the early Christian times and they are the best preserved. Continue to Laodicea located in the Lycus River Valley The city was founded by the Seleucid king Antiochus II and named for his wife Laodice about 260 B.C. Visit the Aqueduct that piped water to Laodicea, visit the stadium, one of the well preserved from the ancient world, built by Nicostratus and dedicated to Vespasian. Visit the “Ephesian Gate" This triple-arched gateway. In the afternoon drive to Miletus , to sylted Meander valley and reach to Miletus once had three ports and it was a sea port. The city is known as the home the Great mathematicians and civil engineers. Paul had visited Miletus at the end of his third journey and met with the elders of the Ephesus church. Visit the city, see the Roman Baths, Roman fountains, grand theater building, 15000 and Proceed to your hotel in Kusadasi for dinner and overnight. The highlight of our day will be our visit to Ephesus, an ancient city of Christian significance that is particularly well preserved (Revelation 1:11): here, we’ll visit the theater, the Odeon, the library and the Roman Baths. Our scenic drive from Kusadasi brings us to the basilica of St. John, built on the hilltop site of the house and tomb of St. John the Apostle. The basilica is now in ruins, but in its glory was a huge, cross-shaped building with a wide nave and two narrower aisles, a building with six domes, marble pillars and open galleries. Here lies the crypt with the tomb of St. John: it was believed by pilgrims during the Middle Ages that the dust rising from his grave had curative powers and was diligently gathered up. St. Paul visited Ephesus between AD 55-58, where his ministry included preaching, conversion, and the baptizing of the twelve disciples (Acts 19: 5-8). St. Paul was imprisoned for several years in Ephesus and is believed to have written portions of the Epistles during his confinement. Ephesus eventually became one of the cradles of Christianity due to his efforts. In addition to saints John and Paul, Ephesus was also the home to the mother of Christ, Mary who was entrusted to John’s care after the Crucifixion and moved with John to Ephesus, where both are believed to have lived the remainder of their lives and are buried. We’ll make a visit to the Chapel of the Virgin Mary, the most important Christian shrine in Ephesus, before returning to Kusadasi for dinner and overnight hotel stay. Drive thru plateau to to Philadelphia (Alasehir) (Rev 3:7-13) which meant "brotherly love". The church of Philadelphia had used the open doors. See the remains of one of the Seven Churches here. Continue to Sardis (Rev 3:1-6), the former capital city of Lydia of King Croesus. See the temple of Artemis, the gate of the Byzantine church, the restored synagogues, gymnasium. Following the visit drive to Smyrna (Izmir) Rev 2:8-11, another one of the Seven Churches was here. Drive thru the city, dinner and overnight in Izmir. Continue inlands to Akhisar (Thyatira). On Paul's second journey, he received lodging and hospitality at the home of Lydia; she gave the purple cloth to Paul. See the remains of the church here. Drive thru plateau to Pergamum. Pergamum was the capital city of the province. Here parchmaint paper was invented, the treasury of the Alexander Great had enrichen the city, it was the center of art of culture. First visit the Acropol view the city from Citadel see the city walls, Trajan Temple, the most steep Theater, the remains of Zeus Altar which was known the Throne of Satans,the Library. Visit the Red Church, which is a brick construction here was once one of the seven churches. The church needed to repent in order to receive the "the white stone" (Rev 2:17). 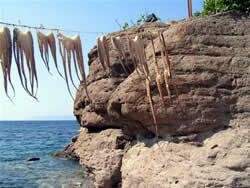 Drive north to Assos along the ancient path where Paul walked with his companions. See the remains of the ancient Roman Road which is stretching from Troas to Assos . Visit Assos where St. Paul met Barnabas, See the ancient city and view the Greek Isle of Lesbos (Mittilini) at a distance. See the theater and doric columns and the ruins of town and the citadel. Following your visit, drive further south, thru the pine forests and hills covered with olive trees. Continue to Alexander Troas where Paul had sailed to Philippi. See the old harbor and the city walls. Dinner and overnight in Canakkale. Canakkale is located at the strait of Dardanelles where Asia meets Europe.In 334 BC Alexander the Great crossed the strait and had a victory against Persians in Granicos and conquered the whole Asia Minor peninsula. In 1915 Allied and Anzac troops had forced to land and fierce battles had taken place in Gallipoli and Canakkale. View the war memorials and drive to the legendary city of Troy of Homeros. See the wooden horse and discover the ancient city with 9 layers of settlements of the ages and re-live the Trojan War and Mythology. Continue to Dardanelle ferry to the European side and drive to Istanbul for Dinner and overnight. Transfer to the airport in time for your return flight to New York , Arriving in the afternoon local time.